Spectacular LAKEFRONT home! BEST LOT in Falcon Pointe with 0.35-mile of FULL VIEW of Mallard Lake! This Lancaster model from Davis Homes is for the selective Buyer eager for a PREMIUM LAKEFRONT SITE! 0.2 -acre lot with 72 ft. on the shore. Original homeowner. This exquisite home has been impeccably maintained and upgraded. 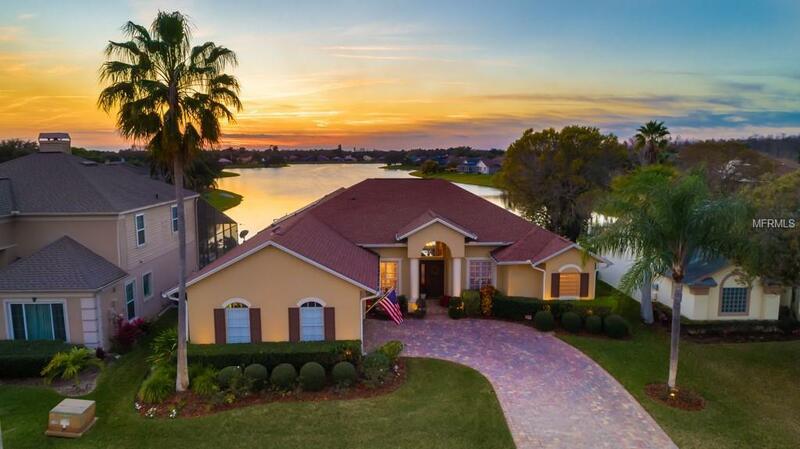 Captivating views of the pool & lake from the master bedroom and living areas. West-facing lanai offers the perfect setting for entertaining or relaxing while enjoying the quiet mornings or the fabulous SUNSET VIEWS and Disney fireworks! NUMEROUS UPGRADES: Paver Driveway and Fountain. Plantation Shutters. Wood Floors. Extended laundry room. Mature Professional Landscaping with landscape lighting at front of house. 2019: A/C New Condenser & Fan. 2018: New Water Heater. 2016: Pool Resurfaced and Retiled, Salt System no chlorine needed; Solar Heating; Pool Patio upgraded to Travertine; Custom Summer Kitchen with granite countertops and ledger stone. 2015: New Roof. 2014: Bathrooms completely updated with travertine tile and custom wood cabinets. 2012: Updated Kitchen with granite countertops, stainless steel appliances, double oven, designer door hardware, crown molding; New Front Door and decorative shutters. Tray ceilings. Fantastic OUTDOOR LIVING making the most of the PREMIUM LOCATION with scenic views of the LAKE! Hunters Creek offers highly rated schools. Nearby healthcare, restaurants/shopping. Dont let this dream home pass you by, A RARE OPPORTUNITY FOR A PRIVILEDGED BUYER!! Additional Lease Restrictions This Property is Not Available For Lease.